54cm Stainless steel Freestanding Cooker is rated 4.3 out of 5 by 12. 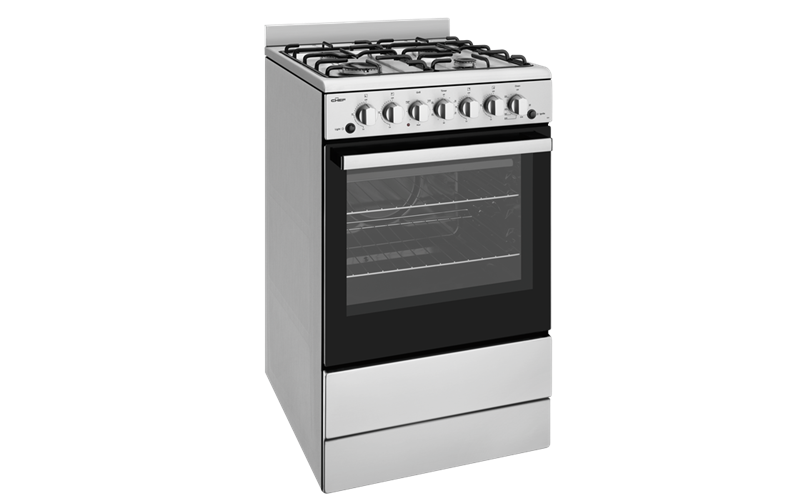 54cm Stainless steel freestanding cooker with conventional oven, timer, light, electric grill in oven, electronic ignition and 4 burner gas hob. Rated 5 out of 5 by Warren 473 from Simple operation, stainless easy-clean oven-stove We have had the stove for one month now, and are very happy with the simplicity of operations, nice dean appearance and it is so easy to keep clean. We have a classic style kitchen, in a heritage listed terrace house. The narrow stove, old gas fittings, and stainless steel finish fits in nicely. Instant gas controls and a great oven with clear visibility and controls. The family are now more interested in the creation of delish meals, fresh pastas, clean veggie bakes, and non-oil meat roasting. Rated 5 out of 5 by Straddiemum from Great price for quality stove I bought this stove for a rental property and was amazed at how quickly it was delivered (up 3 flights of stairs) after purchasing it online. Certainly the easiest way to shop and the staff couldn't have been nicer. Rated 5 out of 5 by Chockey from Best Value & Style I replaced my existing Chef oven with an updated Stainless Steel version and WOW! Its amazing. Quality is excellent, performance super, well, as for looks, it is very stylish. And of course, great value fo rmoney. Rated 5 out of 5 by Mischka from I love it. Bought this a month ago and have lost count how many things we've baked. Its great! it looks great and the installation and removal process was seamless. I can't believe we went so long without a good stove. Rated 5 out of 5 by Anonymous from Oven is perfect for our needs, from ordering to installation was 12 hours AMAZING, your employee on the phone that I spoke to was spot on, polite and professional 5 STARS EXCELLENT. Rated 5 out of 5 by jasonwu882000 from Very high quality of finish. Works great! This is third stove I bought for myself and my friends. So far they all work brilliantly in the past 3 years. Never had any issue. Highly recommended. Rated 4 out of 5 by Anonymous from I actually thought I ordered the oven with separate grill and I didn't. We were disappointed with that but it was my fault when I ordered. Thanks. Rated 2 out of 5 by Anonymous from Three initial problems. A dent in the side, broken grill tray and oven rubber seal falling off. All since rectified by Electrolux thankfully.